Táim ag obair le Oireachtas na Gaeilge agus is é an ról atá agam ná deiseanna a chruthú do chainteoirí Gaeilge teacht le chéile. 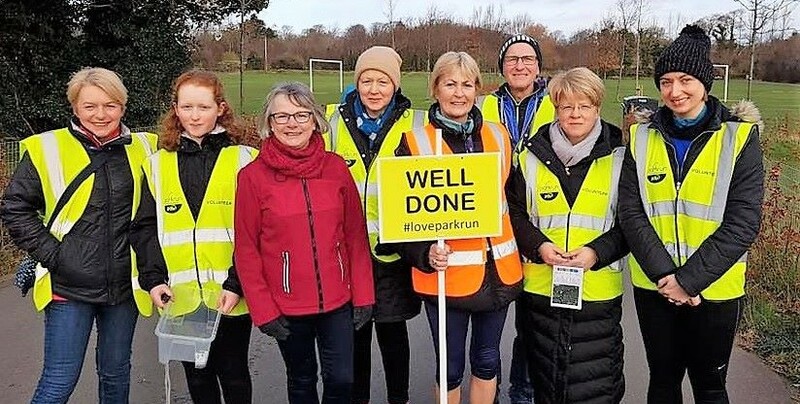 Mar reathaí agus mar dhuine atá an-tógtha le parkrun, shocraigh mé go gcuirfeadh muid bandaí rosta le ‘Ta Gaeilge agam’ ar fáil do rannpháirtithe parkrun thart timpeall na tíre a bhfuil spéis acu Gaeilge a labhairt le chéile. Thug Pádraig Brogan, Stiúrthóir parkrun Iorrais cuireadh dom cuairt a tabhairt orthu Dé Satharn 18 Lúnasa toisc go raibh fáilte ar leith á cur acu roimh chainteoirí Gaeilge ar an lá sin. Agus is mar sin a landáil mé ag an parkrun is faide siar san Eoraip. Maidin cheomhar, ghaofar a bhí ann nuair a bhain mé an Geata Mór amach, thart ar cheithre mhíle siar ó Bhéal an Mhuirthead i gCo. Mhaigh Eo. Ní raibh éinne eile le feiceáil, seachas fear as Bolton Shasana a bhí ag cuardach tús an parkrun freisin. Siar i bhfad thíos ar bhóithrín cúng in aice le Loch na Croise a tháinig muid ar an gcomhartha tosaigh sa deireadh. Ag 9:10 i.n ní raibh le cloisteáil ach beithígh ag géimneach agus an tAtlantach fiáin ag pléascadh ar an trá. Bhí feamainn agus sáile le blaiseadh ar an ngaoth. Ba é Fergus Mac Suibhne, fear áitiúil, an chéad duine eile a tháinig, lena cheamara teilifíse mar go raibh iarrtha air an ócáid a thaifead do ‘Molscéal’, ardán físe ar líne le TG4. De réir a chéile thosaigh daoine eile ag teacht amach as an gceo agus faoi 9:30am bhí 57 duine a raibh miotal aisteach iontu bailithe thart timpeall Phádraig ag éisteacht leis an treorú. Labhair mise faoi na bandaí rosta, chuir Pádraig fáilte chroíúil roimh chuairteoirí as parkrun Dulwich agus Bolton, Shasana, as Cnoc na Cathrach, as Nás na Rí agus as Páirc Mharlaí. Mhínigh sé go rachadh muid thart timpeall an locha deiseal and go mbeadh tae agus caife ann ag ceann scríbe agus leis sin, ar aghaidh linn! Lean muid orainn thar timpeall an locha ar feadh an chéad cúpla ciliméadar agus leis an ngaoth taobh thiar dúinn bhí sé breá éasca agus bhí muid in ann breathnú ar na bláthanna agus na féara sna díoga, ach de réir mar a d’ardaigh an cosán siar ón loch bhí muid in aghaidh na gaoithe agus theastaigh na huillinneacha agus na glúine go géar le dul chun cinn a dhéanamh! D’airigh muid an cúpla céad méadar deiridh éasca arís mar go raibh muid in ann seaicéid lonracha na n-oibrithe deonacha a fheiceáil i measc na ndumhcha agus ar éigean nach bhfuair muid boladh an chaife! Níor chuir an bradán báistí isteach ar dhaoine agus tar éis cúpla nóiméad bhí cairdeas nua cruthaithe agus aithne curtha ar shean chairde in athuair arís. Bhí cuid de na cailíní a ghlac páirt ag freastal ar Ghaelscoil agus thóg siad roinnt bandaí rosta le tabhairt dá gcairde. Bhí Éamonn Cosgrave, as Bré, Chill Mheantáin ó dhúchas ach a bhog go hIorras an Fómhair seo caite ag fiosrú faoi ranganna Gaeilge. Ba é a chéad parkrun é agus dúirt sé go n-oibreodh sé go deonach leo amach anseo. Labhair Caitlín Ní Dhiarmada gurb as Contae na Mí di a bhí ar saoire lena fear céile gurb as Iorras dó agus atá an-tugtha don siúl faoin gclub ‘Siúlach Scéalach’ atá á reáchtáil aici agus labhair sí freisin faoi na féidearthachtaí atá ann clubanna mar sin a bhunú thart timpeall na tíre. D’ith muid an cáca milis álainn parkrunabú a bhí curtha ar fáil ag Uisce, an coláiste Gaeilge áitiúil ina múintear spóirt uisce trí mheán na Gaeilge. Tá cúrsa parkrun Iorrais fíor álainn agus thaitin an sodar thar na dumhcha ar ais i dtreo na háite a raibh na carranna páirceáilte againn níos mó liom ná aon chuid eile den ócáid, le tonnta an Atlantaigh ag pléascadh ar an trá fhada ar thaobh na láimhe chlé. Shuigh mé isteach sa charr arís agus d’airigh mé sásta mar a airím i gcónaí tar éis parkrun, tuirse ar mo chosa, meangadh gáire ar m’aghaidh agus mé ag súil go mór leis an turas ar ais go Conamara. Lá eile iontach san oifig! Má tá spéis agat páirt a ghlacadh in ócáid #parkrunabú! 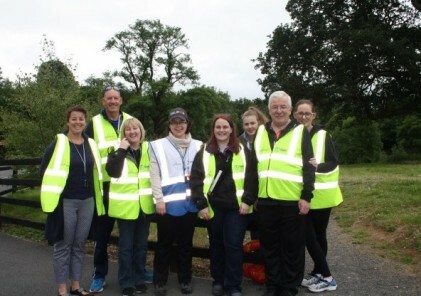 is é parkrun Cheatharlach an chéad stop eile, Dé Sathairn 15 Meán Fómhair, áit a bhfuil Stiúrthóir parkrun Lisa Kennedy agus Bríd de Róiste, gníomhaí iontach na Gaeilge, ag pleanáil lá den scoth don teaghlach uile, le péinteáil aghaidheanna agus caisleán preabach. Beidh KCLR 96FM, an stáisiún raidió áitiúil ag craoladh beo ón parkrun ó 10 r.n. go 12 i.n. agus is é Edward Hayden, an chef cáiliúil a bhfuil Gaeilge ar a thoil aige a bheidh ar an maidhc. Bí linn! I work for Oireachtas na Gaeilge and it is my job to create opportunities for Irish speakers to come together. As a runner and a huge fan of parkrun, I decided we should provide wristbands with ‘Tá Gaeilge agam’ (I speak Irish) to parkrunners around the country who are interested in speaking Irish with other parkrunners. Pádraig Brogan, Erris parkrun Director, had invited me to visit on Saturday 18 August as they were extending a particular welcome to Irish speakers on that day. And that is how I landed at the westernmost parkrun in Europe. It was a misty, windy morning as I reached Binghamstown, about four miles west of Belmullet in Co. Mayo. There was no-one else around, apart from a man from Bolton in England who was also looking for the parkrun start. Way down a narrow little road by Cross Lake we finally saw the start sign. At 9:10am the only sounds were cows mooing and the wild Atlantic crashing on the strand. You could taste seaweed and brine on the wind. Local man Fergus Mac Suibhne was the next to arrive with his TV camera as he had been tasked with filming the event for Molscéal, TG4’s online story hub. Others gradually began to appear out of the mist and by 9:30am 57 hardy souls were gathered around Pádraig for the briefing. I spoke a few words about our wristbands, Pádraig welcomed visitors from Bolton and Dulwich parkruns in England, from Knocknacarra (me), Naas and Marlay parkruns, explained that we would run around the lake in a clockwise direction and that there would be tea and coffee at the finish and with that, we were off! We hugged the lake for the first couple of kilometres and with the wind at our backs it was nice and easy and we could enjoy the flowers and grasses along the ditch, but as the path rose up and away from the lakeside we started to face into the wind and elbows and knees were needed to maintain forward motion! The last few hundred metres down to the finish were easy again as we could see the high vis of the volunteers amongst the sand dunes and could almost smell the coffee. The light rain did not deter people from hanging around for a chat and within a few minutes new acquaintances were made and old ones renewed. Some of the girls taking part go to a Gaelscoil in Dublin and happily took some wristbands to give to their friends. Éamonn Cosgrave, originally from Bray in Co. Wicklow but who had moved to Erris last Autumn and for whom this was his first parkrun, asked about Irish language classes and offered to volunteer at parkrun in the future. Caitlín Ní Dhiarmada, a keen walker based in Co. Meath, holidaying with her husband who is from Erris, talked about the Irish speaking walking club she runs, Siúlach Scéalach, and the potential for setting up other clubs around the country. And we ate the delicious parkrunabú cake provided by Uisce, the local Irish college where waters sports are taught through the Irish language. Erris is a beautiful parkrun course, and the jog back over the sand dunes to where the cars were parked by the lake was for me perhaps the best part of the event, with the Atlantic waves crashing on the long sandy beach to our left. I sat back into the car with that wonderful post-parkrun feeling, legs nicely tired, a smile on my face and looking forward to the drive home to Conamara. Another great day at the office! If you fancy taking part in a #parkrunabú! event, our next stop is Carlow parkrun on Saturday 15 September, where Run Director Lisa Kennedy and the mighty Bríd de Róiste, a dedicated Irish language enthusiast are planning a great day out for all the the family, with face painting and a bouncy castle. Local radio station KCLR 96FM are to broadcast live from the parkrun from 10am to 12pm and celebrity Chef Edward Hayden, fluent Irish speaker will be on the mike. Come along and join us!